This shop has been compensated by Collective Bias, Inc. and its advertiser. All opinions are mine alone. #ShareTheHoliday #CollectiveBias . You don’t want to miss out on this amazing (and easy!) 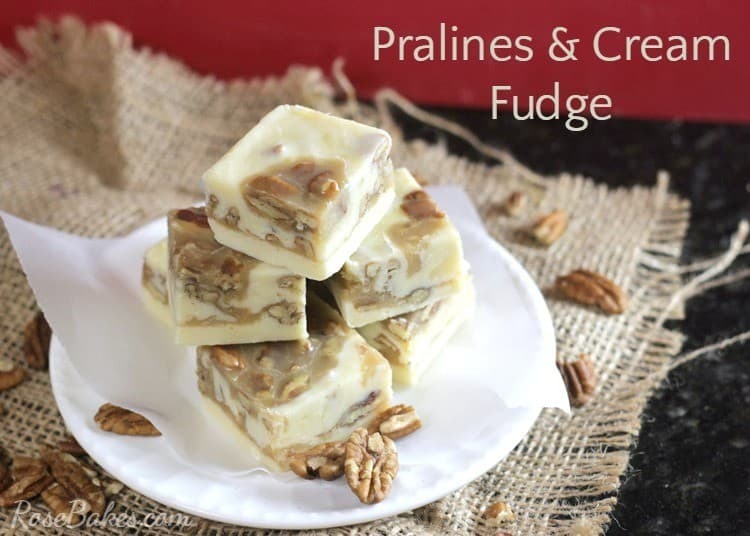 recipe for Pralines & Cream Fudge! I’ve mentioned this before, but one of my favorite things to do during the Christmas season is give delicious homemade gifts. It brings me so much joy to make treats for those I love and see them enjoy something homemade and personal from me. One tradition I’ve started in the last few years is making ‘sweet’ gifts for our Sunday School Class (my husband and I teach). It’s my way of letting them know how much I appreciate their friendship and love for us as teachers! 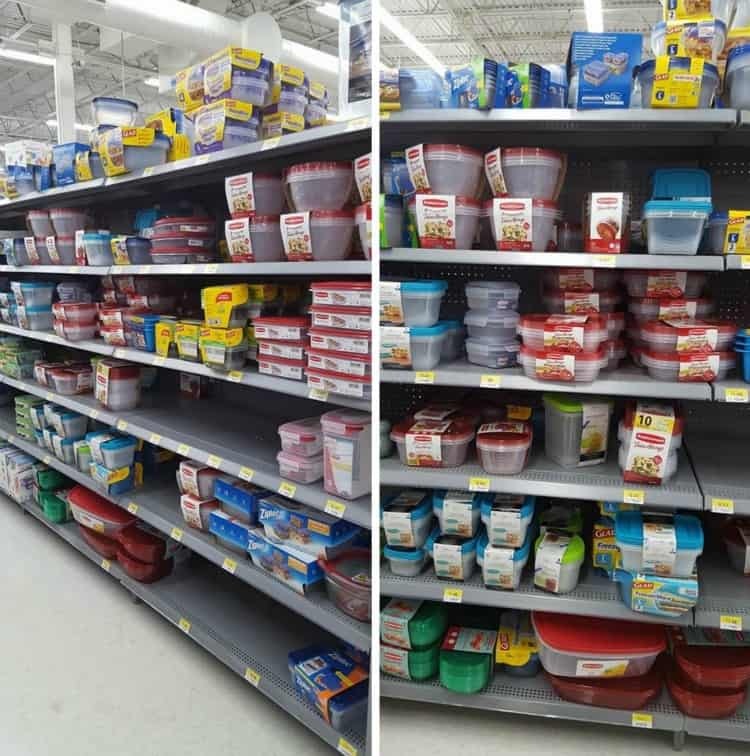 Walmart had lots of shapes and sizes too, so I knew I’d be able to find containers that worked for my project… and I did! Bonus – they’re re reusable and are microwave, freezer, and dishwasher safe. PS. If you like saving money, be sure to take advantage of the Ibotta $1 Off Of Any 2 Rubbermaid TakeAlongs Products rebate offer, exclusive to Walmart shoppers. Okay ya’ll. 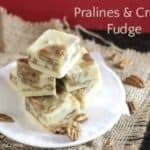 Do you like pralines? They’re one of my favorite holiday desserts to make and they’re also really popular with my extended family! 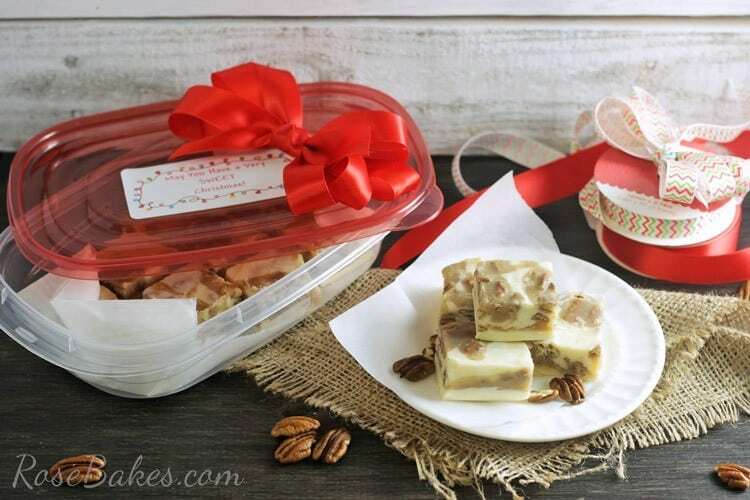 I shared my recipe for Easy Pecan Pralines last year and included them in the gifts for our class. I planned to do them again this year until I remembered some fudge I had late last year. You see… I went to this little fudge shop and lo and behold – they had Pralines & Cream Fudge. It was so, so delicious. I immediately knew I wanted to try and replicate it and that it would be perfect for gift-giving this year! Ya’ll, if I ever had a good idea – this was it!! I’m certain that our Sunday School class is going to go nuts over this fudge and even better… I have a new plan to package it up super pretty! Are you ready for the recipe? And a tutorial? Yeah… keep reading past the recipe and I’ll also show you how to make this easy little bow and you can grab the free printable label! Put it all together with a Rubbermaid TakeAlongs container and you’ve got a “sweet” gift! And when you have them all together, you’re ready to make fudge! 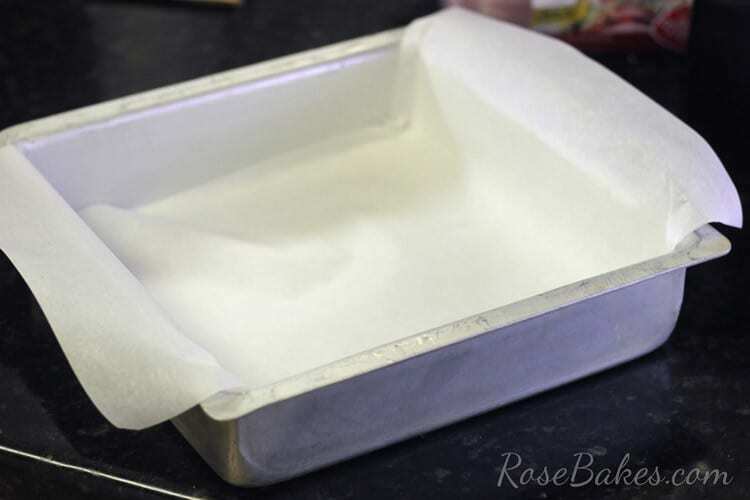 Line an 8×8″ square pan with parchment paper. Then get out two medium saucepans. In the first one, add in the white chocolate chips, sweetened condensed milk and 1 teaspoon of vanilla. Begin heating it and stirring constantly until it’s completely melted. Then pour half of it into the prepared pan. Allow the mixture to thicken and cool slightly then pour most of it over the fudge. I reserve a little to pour on top! It will slightly set up but you don’t have to wait for it to completely harden; then pour on the remaining fudge and the remaining praline mixture. 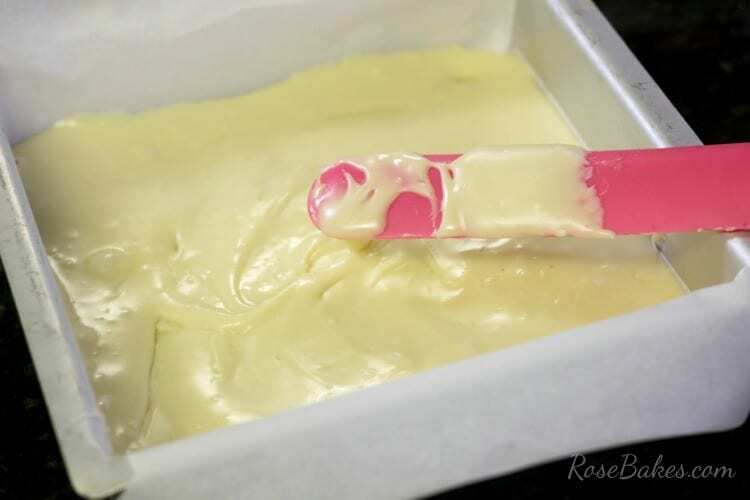 If your fudge has hardened, you can put it back on the stove for a minute and stir it gently to reheat and soften (be careful not to scorch it!). 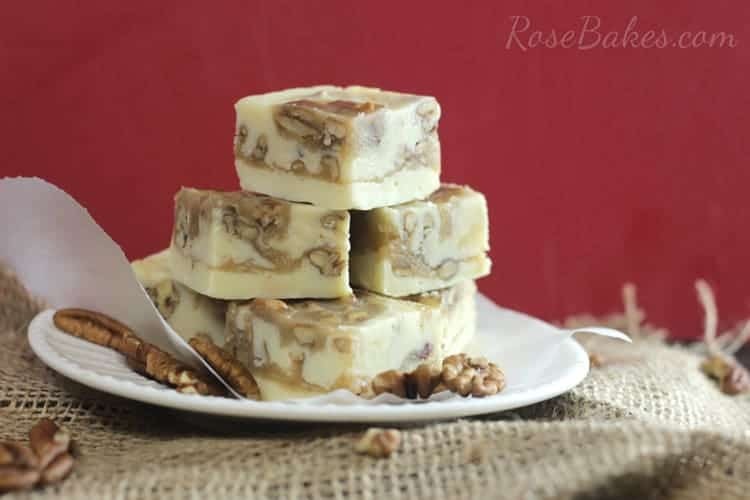 I swirled white chocolate fudge and pralines together a bit so it would be pretty! Then allow it to set up for at least 4-6 hours at room temp or at least 2 hours in the refrigerator. 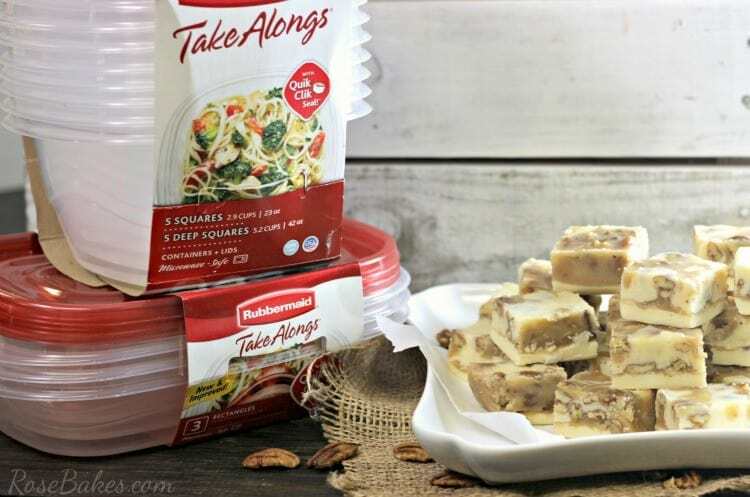 When it’s set, you can use a knife to slide around the edges (especially if the fudge touches the pan anywhere), then lift out the parchment and fudge and cut it into squares! Click here to see how to package this up really pretty and make a homemade bow! 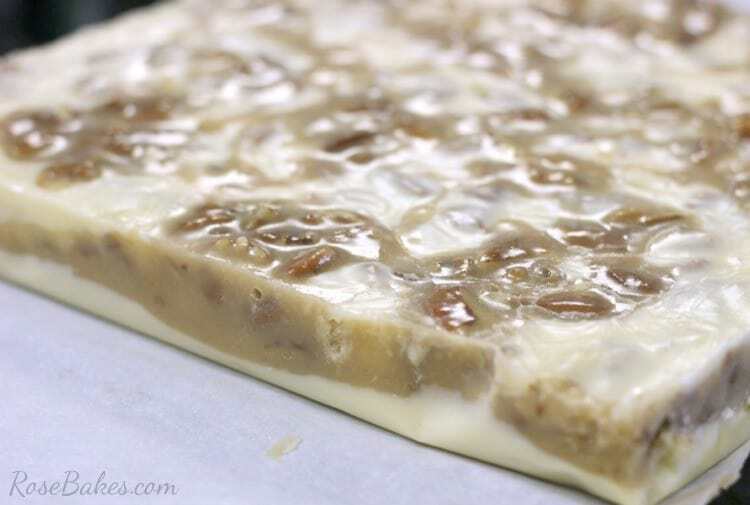 For the white chocolate fudge layers! 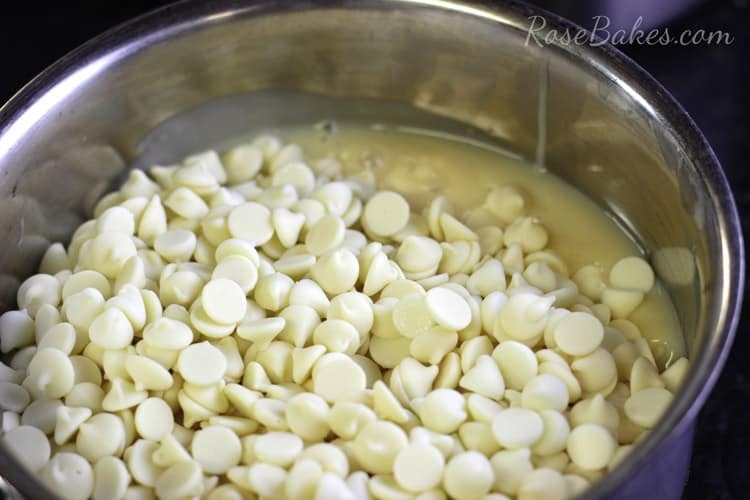 In the first pan, add in the white chocolate chips, sweetened condensed milk and 1 teaspoon of vanilla. For the pralines layer, get your second saucepan and pour in the brown sugar, whipping cream, butter & 1 teaspoon of vanilla. Bring to a boil over medium heat, stirring constantly. Boil for about 1 minute, then remove it from the heat. 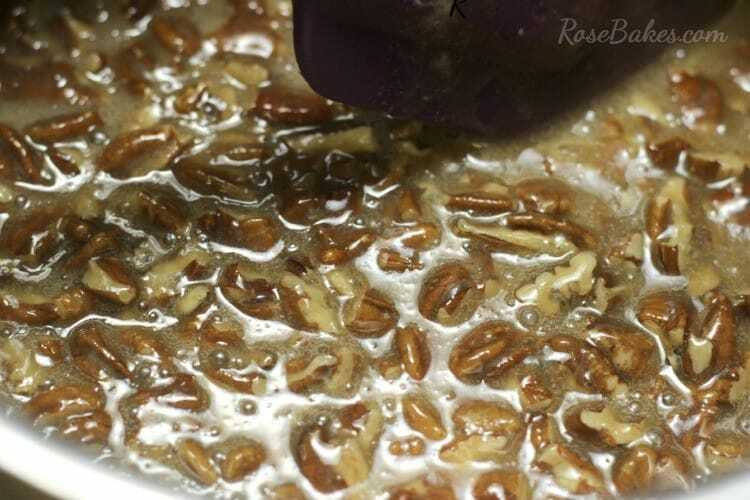 Immediately whisk in the powdered sugar, then gently stir in the pecans. Allow it to set up for at least 4-6 hours at room temp or at least 2 hours in the refrigerator. 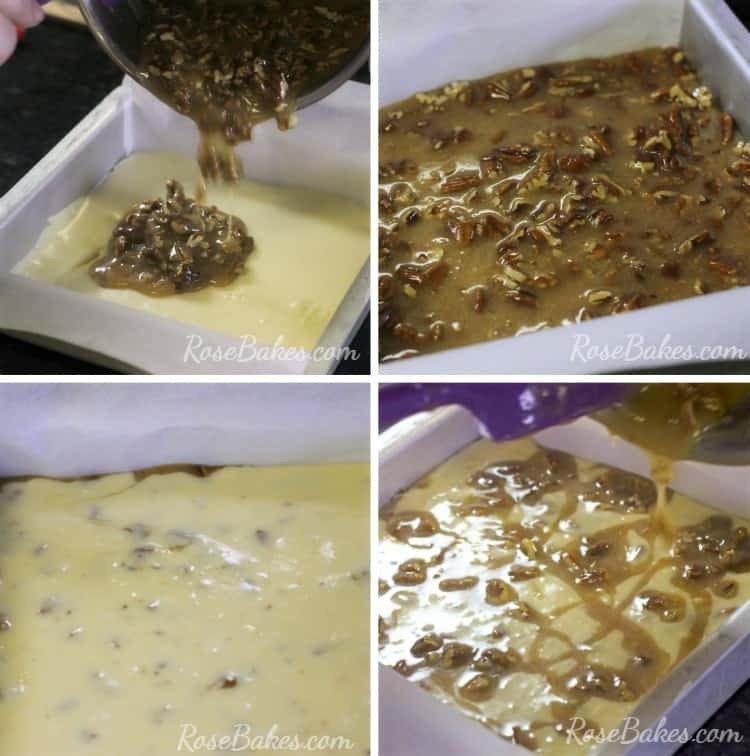 When it’s set, you can use a knife to slide around the edges (especially if the fudge touches the pan anywhere), then lift out the parchment and fudge and cut it into squares! Do you give homemade gifts? I’d love to hear which recipes you use and how you package them… leave me a comment! 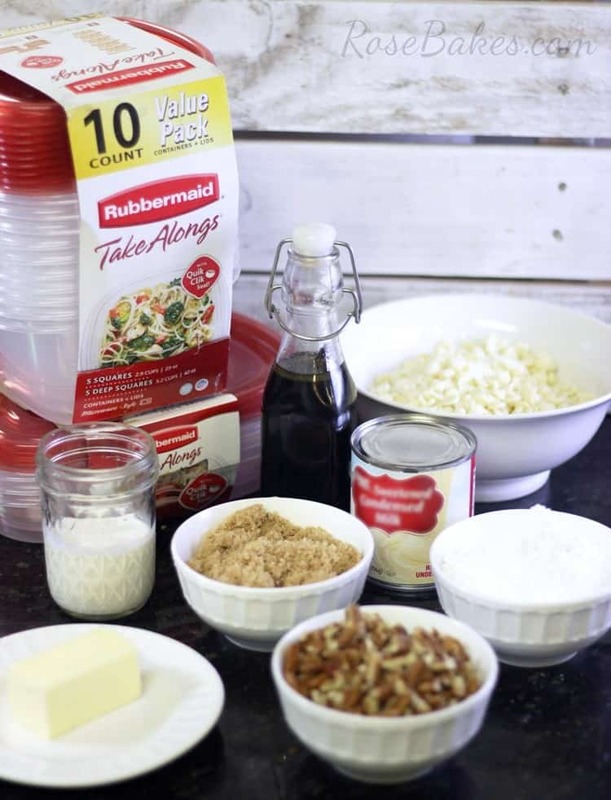 Also, check out more ways that Rubbermaid TakeAlongs are the perfect vessel to transport your holiday dishes here! Oh my gosh . . . that fudge sounds amazing!!! 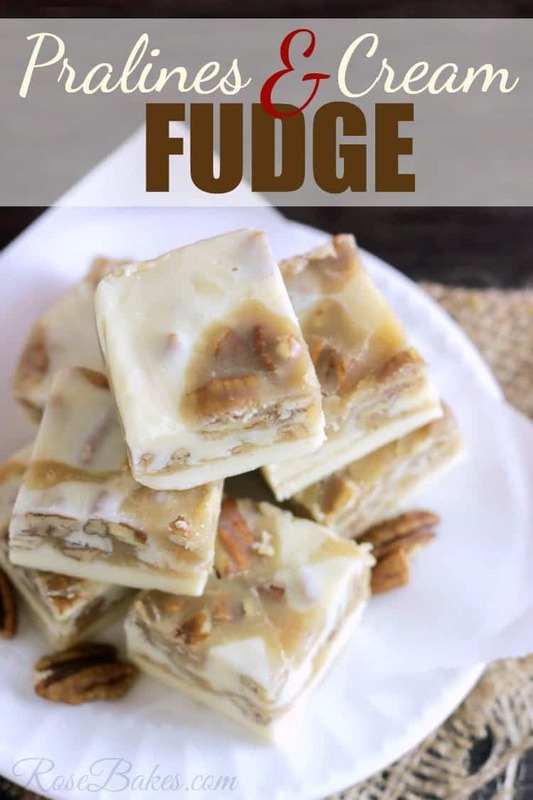 I want to try this, hope it turns out as good as it sounds, I am not good at making fudge. How long will this keep if i package it up for gift giving. I’m not sure, but I know I’ve kept it at least 2 weeks as long as it’s wrapped tight in plastic wrap and it was still perfect! 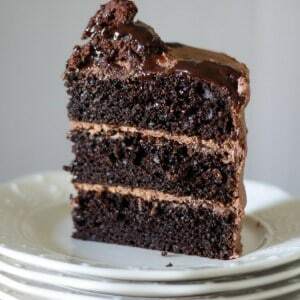 Oh my gosh sound wonderful. Gonna try tomorrow. Thank you and y’all have a Merry Christmas and a sweet one. After getting this recipe I will. Is it better kept in the refrigerator for storing? I keep it at room temp in an air-tight container! Where did you purchase those cute red and green striped twist ties? 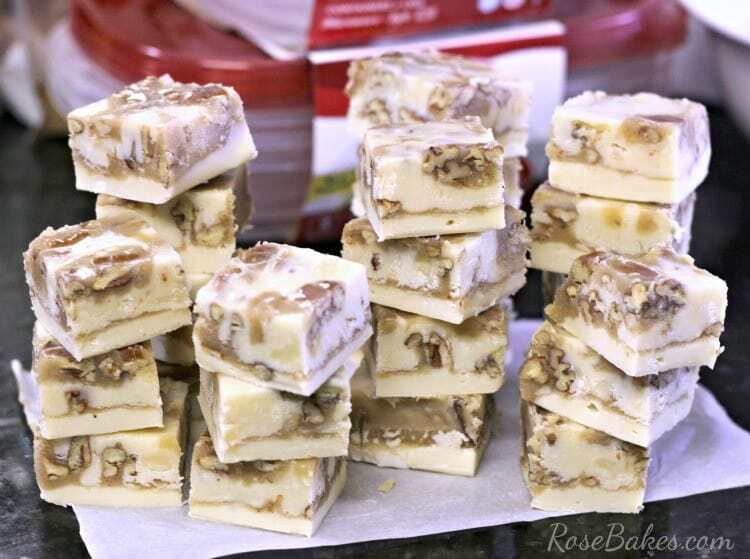 This is one of the best and easiest fudge recipies ever! It is dangerous! Everytime you see it you want to eat some. Wow! Christmas has passed but who cares? I’m making your wonderful fudge soon! Thanks. Love your pretty biws, too! !